We were particularly pleased to welcome our 51 international scholars who came from every part of the globe and were extremely enthusiastic to learn, and will take those lessons back to their home countries for the benefit of their colleagues and patients. 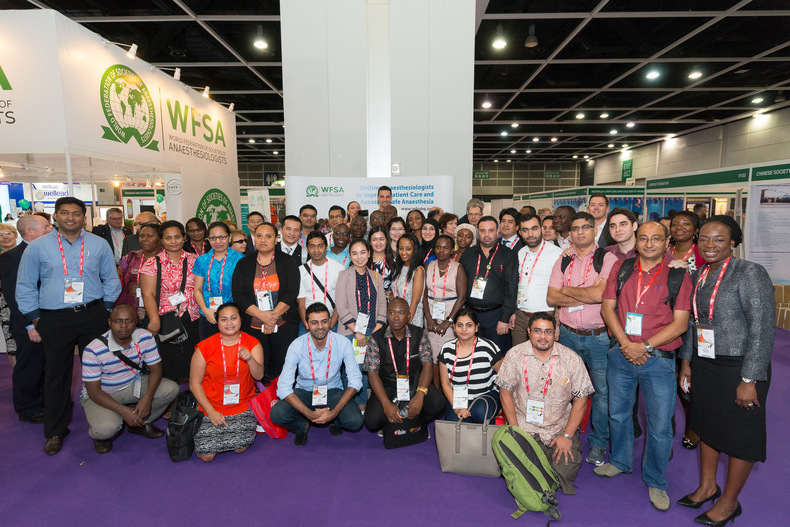 Dr Fifita’s words go to the heart of why the WFSA offers scholarships to the WCA and to regional Congresses. It is by sharing experiences that young anaesthesiologists are able to think more widely about approaches to anaesthesia care, and share this knowledge within their own countries to the benefit of their patients. With 5 billion people around the world without access to safe and affordable anaesthesia and surgery when needed, it is not possible for one organisation to tackle the problem alone. At the Opening Ceremony Dr David Wilkinson, WFSA President 2012 – 2016, announced that Masimo andLaerdal Foundation would be the WFSA’s first Global Impact Partners. Global Impact Partners work with the WFSA and other stakeholders to plan and implement anaesthesia patient safety programmes in a particular country, or countries, where access to safe anaesthesia is particularly limited. Laerdal will focus on SAFE training in obstetric anaesthesia, whilst Masimo will focus on country level development of Anaesthesia Safety Action Plans (ASAP). Below Joe Kiani, founder, Chairman and CEO of Masimo, shares his excitement about the project. By working closely with the National Society of Anaesthesiologists and other key stakeholders, Global Impact Partnerships allow us to work more strategically towards improving patient outcomes and saving lives. The incredible Harold Griffith Keynote Lectures given by Dr Atul Gawande and Tore Laerdal were another highlight of the Congress. Both speakers focused on their personal histories and how that has shaped their understanding of anaesthesia in a modern, global context in what was a thrilling session. Tore Laerdal, Executive Director of the Laerdal Foundation, founder and leader of Laerdal Global Health, and Chairman of Laerdal Medical, gave a fascinating history of the company, including how his father had saved him from a near drowning as a 2-year-old, and how this had inspired him to use his skills as a toy maker to develop life size dolls for children and later full sized manikins to help train Norwegian healthcare workers and the general public in lifesaving techniques. He talked of a key moment in his own career: during a visit to rural hospitals in Tanzania in 2008 where he witnessed two newborns dying, and his realisation that better trained birth attendants and equipment could have saved their lives. Dr Atul Gawande similarly discussed his father’s upbringing in a village in rural India, where much of his family still lives. He discussed the economic development that has gradually improved living standards in India, allowing some people to afford private health insurance and driving the development and expansion of hospital services in the biggest town nearby. Gawande then pointed out, that although anaesthesia and surgery are considered expensive, the World Bank’s report Disease Control Priorities team (DCP-3 Essential Surgery) found that investment in first-level hospital capacity for 44 essential surgical procedures (including C-section, laparotomy, and fracture repair) is among the most cost-effective health interventions available. The WCA also saw the launch of the Safe Anaesthesia For Everybody – Today “SAFE-T” campaign: made up of the SAFE-T Network and Consortium, bringing individuals, organisations and industry together to advance patient safety and the International Standards for a Safe Practice of Anaesthesia. The goal of the SAFE-T Network is to raise awareness of the need for safe anaesthesia as an essential element of safe surgery, the lack of provision, and the need to take action, by advocating together and gathering data to “map the gap” in access to safe anaesthesia. It is by mapping this gap in Actual Provision vs. the International Standards that we can provide strong evidence to Ministries of Health,other governmental bodies and decision makers to ensure more is being done to close the gap. We asked those who took a photograph in our SAFE-T photobooth to give a small donation, which was then generously match funded by Teleflex. All anaesthesiologists should join the SAFE-T Network. If you have not yet joined please click here. It was the international feel of the WCA that was perhaps the Congress’ biggest success. The breadth and depth of the Scientific Programme was testament to the engagement of a range of speakers from across specialties and from different parts of the world. We simply would not have been able to achieve such success without the engagement, positivity and generosity of all who attended. The anaesthesiology profession is extremely privileged to have such a large network of engaged individuals that can be brought together by a Federation of Member Societies every four years. This coming together to share experiences, learn from one another, and shape the future of anaesthesia and global health is immeasurably important and will benefit patients for generations to come. The WCA is often described as the Olympics of Anaesthesiology. WCA 2016 has demonstrated, once again, the suitability of this description. So from the WFSA, a big thank you to the SAHK and to all who attended! The World Federation of Societies of Anaesthesiologists unites anaesthesiologists around the world to improve patient care & access to safe anaesthesia. Through advocacy and education programmes we work to avert the global crisis in anaesthesia.